Looking for a solution to your low back pain? Did you know 85% of people suffer from low back pain at some time in their life. The evidence shows that manual therapy such as the chiropractic adjustment and exercise prescribed from a trained specialist are 2 of the best ways to combat low back pain. Here are a few great low back stretches to get you started. 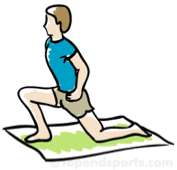 Here is the most important stretch if you sit a lot on a daily basis. The hip flexors are meant to function when we are upright, sitting all day keeps them in a shortened position which increases our low back normal alignment and leads to irritation of the low back joints. These are common pain producers.